Feeding: The Bull Terrier is prone to weight gain so take care not to over feed them. Temperament: The Bull Terrier of today is much gentler than its ancestors yet will still defend themselves and their owner if they feel the need. They are not bred to be a guard dog. They are fun-loving, active, courageous, fearless dogs who are very loyal and can become very attached to their owners. Family Dog: The Bull Terrier can make a good family dog for active families who have time for them. They love to be with the family and need lots of physical and mental stimulation. They can be a bit too energetic for small children. They are not recommended to be in a home with other small non-canine pets. Shedding: The Bull Terrier is an average shedder with heavy shedding twice a year. Grooming: The coat of the Bull Terrier is easy to groom. It should be brushed occasionally. Training: The Bull Terrier can be difficult to train. They should be trained using positive reinforcement from a young age. Weather: The Bull Terrier prefers warmer climates. Exercise: The Bull Terrier is a very energetic breed who requires lots of daily exercise. Living Conditions: The Bull Terrier can live in an apartment provided they get plenty of physical and mental exercise. They are relatively active inside but should have at least a small yard in which to play. Appearance: The Bull Terrier is a strongly built and muscular dog with a round, short, strong back and long oval head which is almost flat on top. Size: The Standard Bull Terrier should be between 20 to 24 inches tall with an average weight of 45 to 75 pounds. The Miniature Bull Terrier stands between 10 to 14 inches tall and weighs between 25 to 35 pounds. Companionship: The English Bull Terrier makes a perfect companion dog. Head: The Bull Terrier has a long, strong, oval head which is almost flat between the ears. It gradually slopes downward toward the nose without a stop, hollows or indentations. It is often referred to as egg shaped. The distance from the eyes to the tip of the nose is much greater than the distance from the top of the head to the eyes. The underjaw is well-defined and deep. Nose: The nose of the Bull Terrier is black in color with well-developed nostrils. Eyes: The Bull Terrier has small, triangular-shaped eyes that are well-sunken and dark in color. They should be set close together and high on the dog's head. Ears: The ears of the Bull Terrier are close together, small and thin yet be capable of being held erect. Teeth/Bite: The teeth of the Bull Terrier should meet in level or scissors bite. Neck: The neck of the Bull Terrier should be long, arched and muscular tapering from the shoulders toward the head. It should be free of any loose skin. Body: The body of the Bull Terrier should be well rounded with well-sprung ribs and slightly arched over the loin. The back should be short and strong. There should be no slackness or dip behind the withers. The underline should have moderate tuck up. The chest should be broad and deep when viewed from the front. Forequarters: The shoulders of the Bull Terrier should be strong and muscular without heaviness. The shoulder blades should be broad and flat with a very pronounced backward slope from the bottom edge to the top edge. The legs should be of moderate length, straight and heavily boned but not course. The dog should stand firmly on the front legs with the elbows turning neither in nor out. The pasterns should be upright and strong. Hindquarters: The rear legs should be heavily boned but not coarse and parallel when viewed from behind. The thighs are very muscular with well let down hocks and short upright pasterns. The stifle joint should be well bent with a well-developed second thigh. Gait: The Bull Terrier should have a smooth gait covering the ground with free, easy strides. The front and rear legs should move parallel to each other when viewed from the front or behind. The forelegs should provide good reach with the rear legs moving smoothly. Feet: The Bull Terrier has round, compact with well-arched toes. Tail: The Bull Terrier's tail should be short, low-set and carried horizontally. It should be broad at the base and taper to a fine point. Color: The Bull Terrier comes in two varieties the White Bull Terrier which has a white coat with possible marking on the head and the Colored Bull Terrier which can be any color other than white and may have white markings. Brindle is the preferred color. Coat: The Bull Terrier's coat should be short, flat and harsh to the touch. It should have a fine gloss to it. The dog's skin should fit tightly. 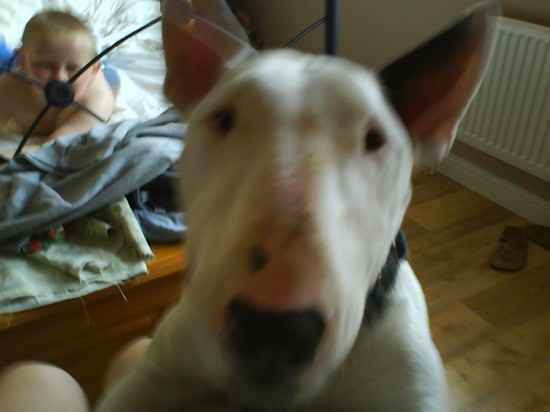 Life Expectancy: The average life expectancy of the Bull Terrier is 10 to 12 years. Characteristics: The Bull Terrier is a determined, Industrious and spirited dog. They can be clownish and find ways to make their own fun. The Bull Terrier is often stubborn but definatly not stupid. They are loyal to their owners and something of a hunter so not always sociable. Health: The Bull Terrier is generally a healthy breed although some may be born deaf or suffer from a zinc deficiency which can lead to death. They may also suffer from obsessive compulsive behaviors, luxating patella, allergies and be sensitive to fleas and other parasites. Litter Size: The litter size of the Bull Terrier ranges from 1 to 9 pups with the average being 5. History: The Bull Terrier was created as a Bull-Fighting dog during the 1830s as a dog that would attack even more agilely. They were created by crossing the Bulldog with the Old English Terrier and later the Spanish Pointer. As it turned out the Bull Terrier was not the most successful fighting dog. In 1860 the white-coated Bull Terriers were given the nickname the "White Cavalier". They were continued to be bred by an English dog dealer named James Hinks and soon became a fashionable pet for nobles. The colored variety was developed by crossing with brindle Staffordshires. The Miniature was developed to with the same standard in mind but to have a smaller size. The Standard Bull Terrier was first recognized by the AKC in 1885 but it wasn't until 1991 that the AKC accepted the Miniature Bull Terrier. The AKC recognizes the Standard Bull Terrier and the Miniature Bull Terrier as two separate breeds where other clubs recognize them as the two varieties of the same breed.